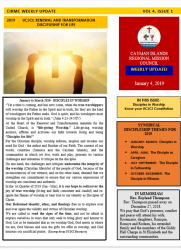 As I reflect on the focus of worship for the first quarter of 2019, I am inclined to re-imagine worship as defined at a recently held Council for World Mission (CWM) Workshop on liturgy. The workshop was held in Kingston, Jamaica from November 30 to December 6, 2018. I had the privilege along with Rev. 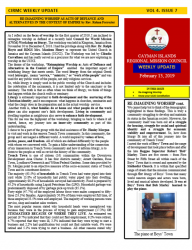 Dr. Ralph Hoyte and RDGS Mrs. Mauleen Henry to represent the United Church in Jamaica and the Cayman Islands (UCJCI). The Workshop was led by Cláudio Carvalhaes and has really served as a precursor for what we are now exploring in worship in the UCJCI. The theme of the workshop, “Reimagining Worship as Acts of Defiance and Alternatives in the Context of Empire” enabled the important aspect of redefining liturgy that meets needs. 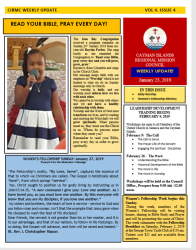 The word liturgy from the original Greek word leitourgia means "service," "ministry," or "work of the people" and was used for any public work of the people, not only religious services. 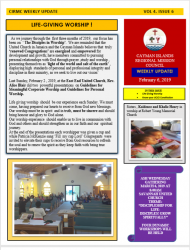 Last Sunday, February 2, 2019, at the East End United Church, Rev. Alice Blair did two powerful presentations on Guidelines for Meaningful Corporate Worship and Guidelines for Personal Worship. 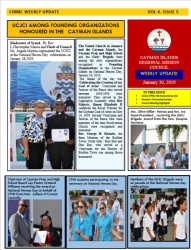 The United Church in Jamaica and the Cayman Islands, the Cayman Prep and High School and the Girls’ Brigade were among the sixty organizations recognized as Founding Organizations in the Cayman Islands on National Heroes Day, January 28, 2019. The theme of the day was ‘Celebrating the Creation of our Coat of Arms’. Vestrymen and Justices of the Peace who served between 1956-1958 were honoured. 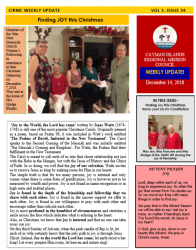 They served in the Legislative Assembly when Her Majesty, Queen Elizabeth II conferred the Royal Warrant for the Cayman Coat of Arms on May 14, 1958. Several Vestrymen and Justices of the Peace who were members of the then Presbyterian Church were recognized and honoured. Peace in the Congregation should be assumed as a ‘given’. 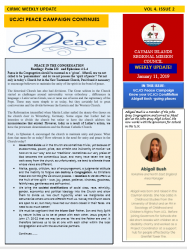 After all, are we not called to be ‘peacemakers’ and do we not possess the ‘spirit of peace’? Yet not only in today’s Church but in the New Testament Church, Paul found it necessary to encourage believers to maintain the unity of the spirit in the bond of peace. 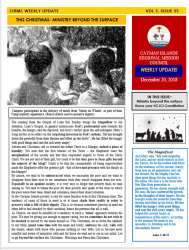 The reading from the Gospel of Luke this Sunday brings the Magnificat to our attention. Luke’s Gospel, in general, underscores God’s preferential care towards the humble, the hungry, and the deprived, and God’s verdict upon the self-indulgent. Mary’s Song invites us to reflect on the surprising inversion in God’s actions; ‘He has brought down the powerful from their thrones and lifted up the lowly’, He has filled the hungry with good things and sent the rich away empty’. ‘Joy to the World, the Lord has come’ written by Isaac Watts (16741748) is still one of the most popular Christmas Carols. Originally penned as a poem, based on Psalm 98, it was included in Watt’s work entitled ‘The Psalms of David, Imitated in the New Testament’. The Carol speaks to the Second Coming of the Messiah and was initially entitled ‘The Messiah’s Coming and Kingdom’. For Watts, the Psalms find their fulfillment in the New Testament. 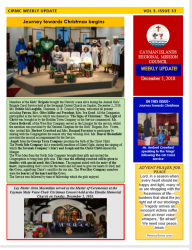 Members of the Girls’ Brigade brought the Nativity scene alive during the Annual Girls’ Brigade Carol Service held at the Savannah United Church on Sunday, December 2, 2018. Ms. Debbie McLaughlin, Chairman, G. B. 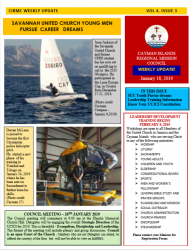 Council Cayman, welcomed all present including Patron, Mrs. Olive Miller and President, Mrs. Iva Good. All the Companies participated in the Service which was themed as ‘The Signs of Christmas’.